A cold frame is a small structure that makes use of sun energy and a light insulation to create a warmer climate zone for your garden. If you have ever enjoyed a salad of vibrant greens in January you may have been eating the product of a cold frame environment. However you decide to use cold frames, keep in mind a few simple factors. There are plants that will grow better in cold frames like low growing, cool-season varieties. The type of structure you use will determine how much protection the plants will have. You will need to watch your crop throughout its growing season to regulate temperature, light, moisture and wind exposure. If at the end of the summer season you don’t want to lose your tropical plant you can place them in a cold frame to winter over. Keep in mind that this will not be greenhouse growing conditions, but you can take them into a tender dormancy. Before placing the plants into the cold frame, cut them back as much as possible. If not in a pot, transplant them into an oversized plastic container with lots of soil for insulation. Place several pots into the cold frame and pack them tightly adding leaves or other mulching material to reduce any large air gaps. Be sure to water all plants thoroughly. Throughout the winter you will need to keep any eye on plants to insure a healthy dormancy. The soil should be damp but not wet and light should be at a low level. You can place translucent plastic over the frame to limit light and control temperature fluctuations. It works best if the cold frame is located where it will not be exposed to extreme winds and spikes in temperature. When you use a cold frame, you can start seeds in flats or sow them right into the soil. Using this method will reduce transplant shock that many seedlings suffer from. When planting seeds in late winter or fall, choose cool-season plants because they will germinate in the lower temperature. If you will be sowing directly into the soil of the cold frame be sure it is in place at least two weeks before you plant so the soil can warm for germination. Remember to keep the soil evenly moist to encourage germination. Once seeds have sprouted, you should vent the cold frame more frequently to encourage air circulation. Plants that are removed from a warm protected area like a greenhouse or an indoor growing space into the garden will need to be gradually acclimated to outdoor growing conditions. Typically this is done by bringing the plants outside and then back inside daily leaving them out each day for longer periods of time. The same results can be achieved by using the cold frame and simply opening/closing it. To maximize success in the hardening-off period it is important to know the weather forecast and time the move accordingly. Cool weather plant will need a period of temps that do not fall below 35F. For warm season plants, the temperature needs to be holding above freezing. Seedlings need to be well rooted with foliage forming before moving them into the cold frame. When the young plants have been packed tightly into a frame, you will need to begin venting the frame during the warmest time of day and slowly increasing the how long the frame is left open. As your seedlings acclimate to the lower temps and more light, their leaves will typically thicken and become more vibrant in color. If you see new growth that is a good sign the transition is successful. 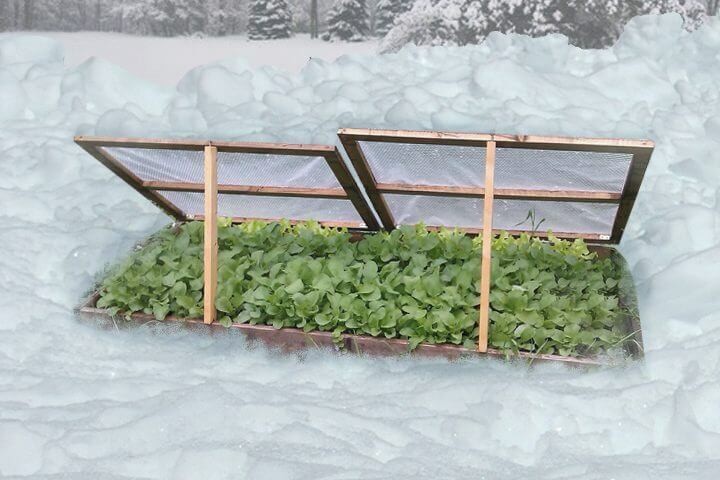 Cold frames can be built by many different constructions methods, but most are quite simple and easy to build. Some are merely old windows placed over a raised bed. But however simple or sophisticated your frame, it will provide you new opportunities for an extended growing period.